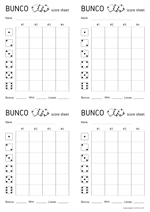 Bunco score sheets on an A4 size paper in a vertical, portrait orientation. Four pieces on one paper so it is easy to cut. 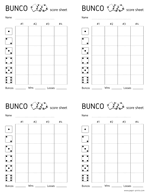 Bunco score sheets on a letter size paper in a vertical, portrait orientation. Four pieces on one paper so it is easy to cut.